Sometimes the typical tie drawing for Father’s Day gets old. Showing students how to draw a large trophy worked well for this craft project. 1. Students made a board by gluing 7 large popsicle sticks across 2 vertical ones. This was allowed to dry while drawing. 2. On a piece of white paper (cut to fit on the popsicle board) students drew a large trophy, and added any message they wanted inside. 3. A piece of dry wax paper (like the kind found in a bakery) was taped over the top of the drawing. Their entire paper drawing was traced and colored in with Sharpie permanent markers. 4. The drawing was cut out with a scissors. A mix of 50/50 watery glue was brushed over the board and on the back of the drawing, which was placed on the board. More glue was brushed on top. Brush off any extra or the board may warp when drying. Magnets could be glued on the back of this to make some nice refrigerator art. 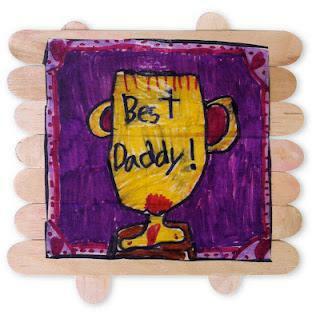 Thanks to Miranda, a talented 2nd grader, who made this beautiful artwork for her father last week.